"Another decade is probably straightforward. There is certainly no end to creativityâ, Gordon Moore, 2003. 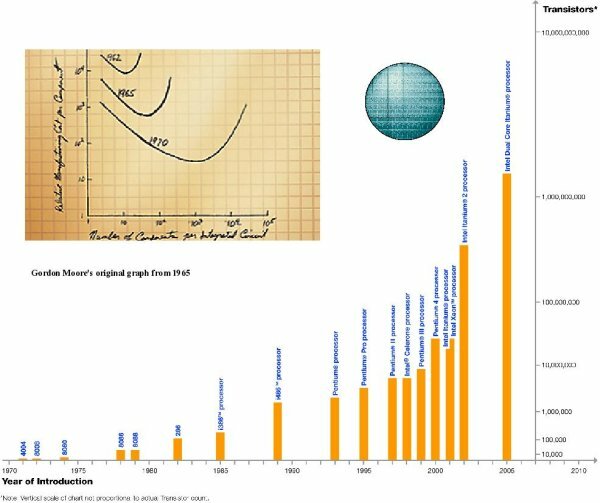 Moore's Law is expected to deliver increasing transistor densities for at least the near future but power consumption and heat generation, which rise exponentially with clock frequency, will limit the increase in the CPU clock frequency. High-performance computations are rapidly becoming a critical tool for conducting research, creative activity, and economic development. In order to provide intense computing platforms and still maintain the historic rates of performance and price/performance improvements, more execution cores are being integrated into each CPU. With multiple cores executing simultaneously, CPU clock frequency can be reduced in order to contain heat generation, while still increasing total system performance. 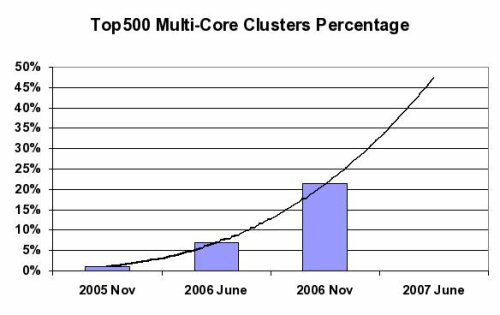 This mega-trend, shown below in Figure Two, is one of three trends that are shaping the technical computing market â clusters, multi-core environments, and high-performance industry standard interconnects. Efficient data transfer between clustered compute nodes is critical for balanced system performance. In a balanced system, the overall performance is equal to or greater than the sum of its components, while in a non-balanced system, the performance is less than the sum. The challenge of achieving balanced performance becomes more evident in multi-core environments. A multi-core environment introduces high demands on the cluster interconnect and the interconnect needs to be able to handle multiple I/O streams simultaneously. By providing low-latency, high-bandwidth and extremely low CPU overhead, InfiniBand is emerging as the most deployed high-speed interconnect, replacing proprietary or low-performance solutions. In a multi-core environment, it is essential to avoid interconnect protocol processing in the CPU cores. In order to maximize the overall compute cluster efficiency and to allow performance-hungry applications to efficiently utilize the CPUâs core resources, a fully hardware transport-offload solution is needed. Furthermore, un-necessary overhead on the CPU cores reduces the ability of balanced computing between the various cores, leading to higher degradation in real application performance. Interconnect flexibility is another requirement for multi-core systems. As various cores can perform different tasks, it is necessary to provide remote direct memory access (RDMA) along with the traditional semantics of Send/Receive. RDMA and Send/Receive in the same network provides the user with a variety of tools that are crucial for achieving the best application performance and the ability to utilize the same network for multiple tasks, such as compute, storage and management. Mellanox InfiniBand provides both the flexibility and a full hardware transport-offload implementation. Transport-offload capabilities enable various applications and software interfaces, such as Message Passing Interface (MPI) to use overlapping of CPU computations with the interconnect communication cycles to reduce run time of MPI-based applications and to increase application performance. Mellanoxâs hardware implementation also provides quality of service (QoS), so different I/O streams could be served as required by the application.